I suggest you sit down if you are not already doing so... I HAVE A JOB! Yes, the kind where you get up in the morning and go to a building and you do this thing called work with these people called co-workers. Weird. I know, the concept is kind of new to me and I am super pumped up about it. (Can I hear a "Pump, pump, pump it up!")? I got a job in La Jolla at the University of California San Diego as a graphic designer. Woot! Woot! I am not a failure. I was beginning to think that I would forever remain a gypsy. I thought that maybe I was one of those people that smell bad and doesn't know it. One of those people that should be named Valerie Schmeltz. One of those people that is mentally retarded and doesn't know it. Well, turns out I'm not. Or if I am, I was finally able to trick enough people into thinking otherwise and now I can be a responsible citizen with something to offer the world. My sister, Amanda, told me that now I don't have to decide between eating or buying deodorant. I am thrilled to be able to do both, and to be designing again (because I'm pretty damn good). It will be fun to explore the University because there are tons of cool buildings, and I'd like to get started on my Masters in Architecture before I turn 50. Check out the photo of the library below, meanwhile I will concentrate on being awesome. Congratulations! Though remember, plenty of mentally retarded people get jobs. If I still had Lou, I would let you climb on the roof and then we would drive around in celebration. Good job. 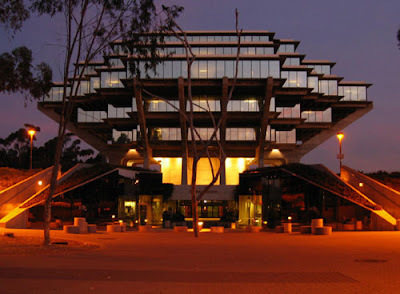 Is it just me, or does the library look like a space ship? I'm so proud to know that you can finally support our baby. I am proud of you, too! Love you!